Dear Mrs Astley — it is with the greatest grief that I write to you to tell you of your son’s death which took place at 8 a.m. this morning. It was very foggy, and your son went down a breastwork to visit some posts along it and I fear that perhaps he may have thought that he could not be seen and have over-exposed himself. He was shot by a sniper through the heart and death was instantaneous. I cannot tell you how very much we all sympathize with both you and his fiancée at his loss and how sad we all are. He was as gallant a soldier as I have ever come across, and absolutely did not know what fear was. On February 6th he led the party which assaulted the brickstacks and led them in the most gallant manner. He was very popular with us all, always cheerful and anxious to help and I feel that in his death I have lost a most excellent officer and a charming fellow. Please accept my heartfelt sympathy, and that of my Battalion. He will be buried tomorrow morning among other soldiers in a little cemetery at the Southern end of Le Plantin. This letter describing the death of Sir Roland James Corbet at Givenchy today is reproduced from a handwritten copy sent to Kittie Calderon by his mother, her closest friend, Nina Astley (Corbet). Feilding’s letter did not reach Nina until 19 April. Between now and 20 April I will post documents that tell how the terrible news broke over Nina’s and Kittie’s families. Jim Corbet had been in France with the Coldstream Guards since 13 August 1914. 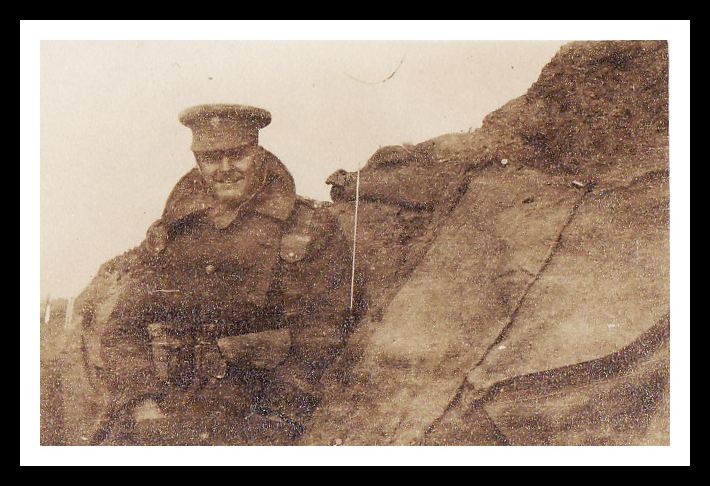 He was wounded at the Battle of the Marne (see my post of 8 September 2014), promoted lieutenant on 9 December 1914, and joined the 3rd Battalion Coldstream Guards at La Bassée, where he fought in the Battle of the Brickstacks January/February 1915 (see my post of 27 January). He was twenty-two and Colonel Geoffrey Feilding was his Commanding Officer. The above photograph was taken a few weeks before he was killed. As I shall describe, he held a special place in Kittie and George’s affections. This entry was posted in George Calderon, Timeline and tagged Battle of the Brickstacks, British Expeditionary Force, Coldstream Guards, Colonel Geoffrey Feilding, George Calderon, Givenchy, Jim Corbet, Kittie Calderon, La Bassée, Nina Astley, Sir Roland James Corbet, The Great War, World War I. Bookmark the permalink.